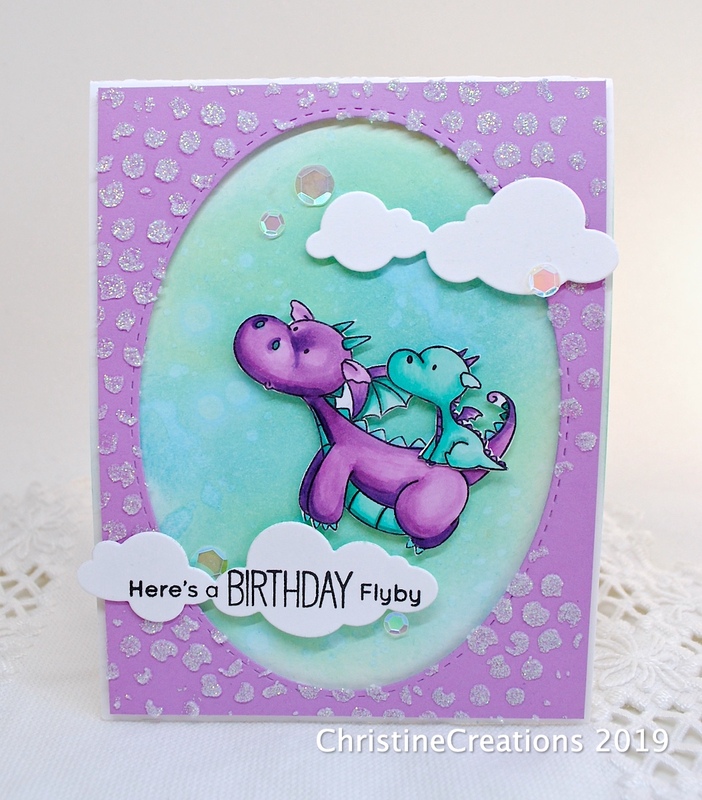 Having some fun today with the adorable set, MFT Magical Dragons. I purchased it with my niece in mind, and yet it’s fun for a lot of different people and occasions. 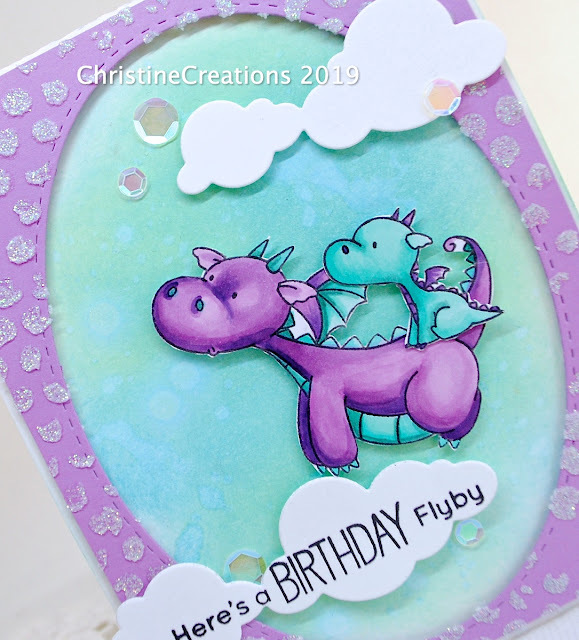 This cute dragon and baby are flying off for a Birthday adventure. I’ve coloured them with Copics and trimmed them out. I created the background sky with Distress Oxide Inks (Broken China and Cracked Pistachio). The clouds are from The Cat’s Pajamas using the Cloud Border CutUps Die. 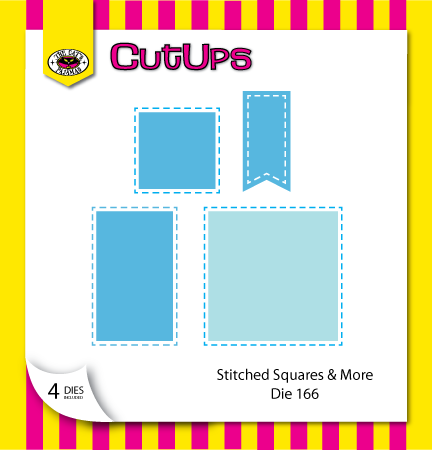 I cut the die it two sections to match the MFT Sketch Challenge this week. The glittery pattern on the outside of the oval is with a Tim Holtz Stencil and Nuvo Glitter paste. I few iridescent holeless sequins (from The Cat’s Pajamas) finish it off. Another cute Birthday design to add to the stash! On this beautiful Easter weekend, and today as we celebrate Good Friday, I thought it would be fitting to share some Scripture and a couple more watercolor wreaths I’ve worked on. (more wreaths HERE, HERE and HERE). And where that first Good Friday must have felt deeply sorrowful, full of questions and fear, I have two beautiful portions of Scripture that reinforce the truth that we are not alone and we are loved. Friday doesn’t have the final word, Sunday’s coming! 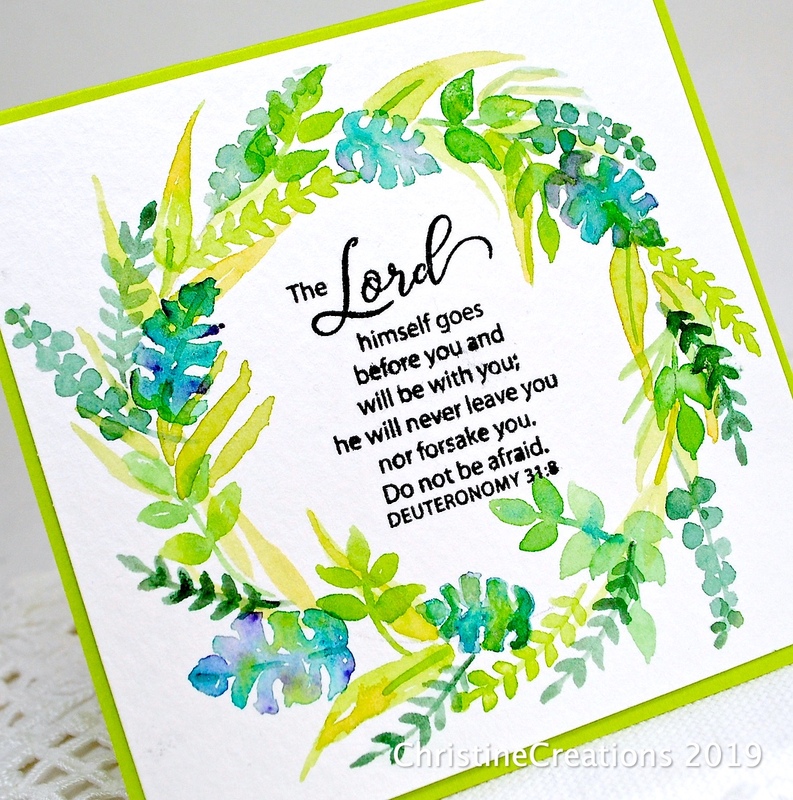 For this first design, I wanted to try out some greenery instead of flowers. I LOVE how it turned out overall, probably because green is my favourite colour, and there are so many shades of it that you can play with. There are elements of it that I do need more practise on, primarily the Monstera leaves. I love that they are multiple colours, but their shape needs some work, and I ended up fiddling with them too much. It’s a start and I’ll keep practising! 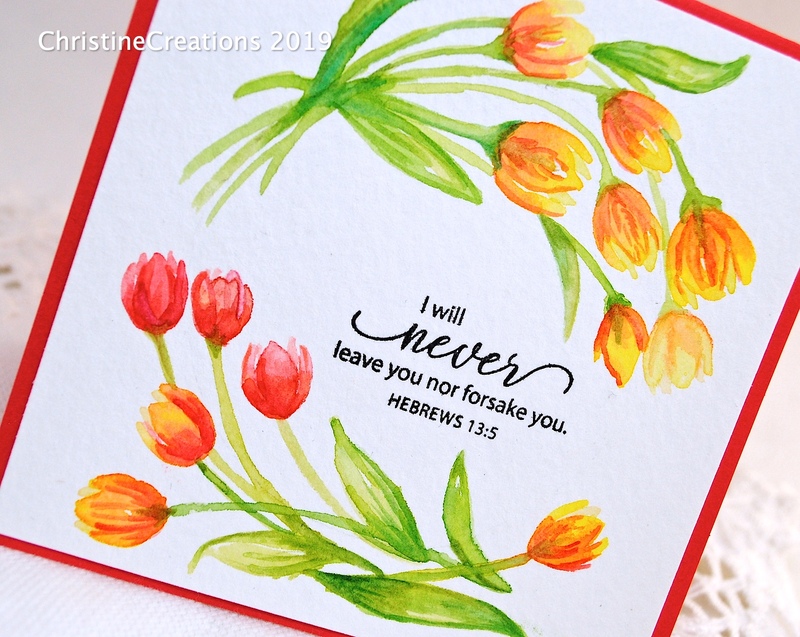 The painting is done with Daniel Smith watercolours and the Bible Verses are from Stamp Simply’s set Fear Not. One of the drawbacks of watercolor paper is that the ink tends to feather a bit too much, so its not as crisp as I’d like. 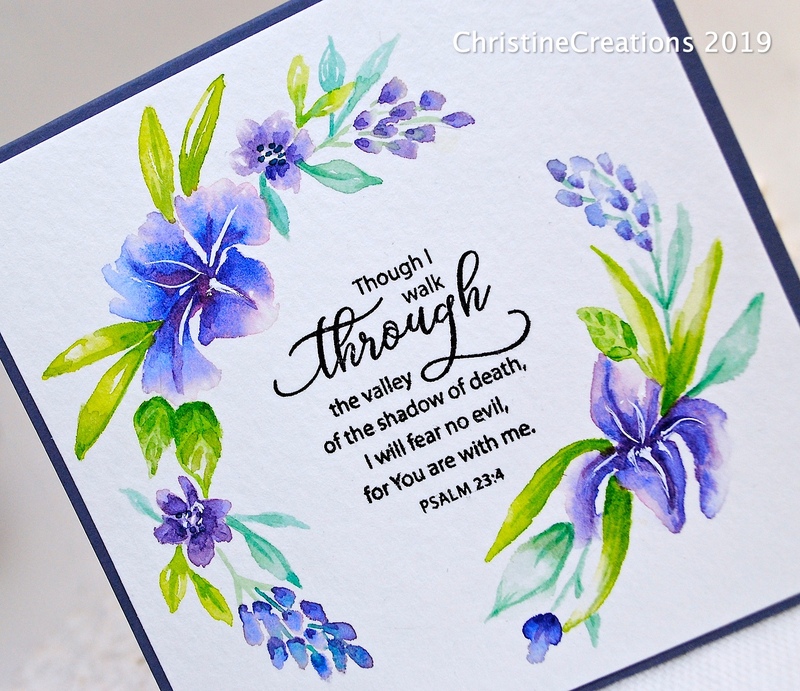 Do you have an ink you like on watercolor paper for really crisp words? This design showcases another stamp from the Fear Not set, and some pretty spring tulips. I like the simplicity and shape of the tulips here. I think my next purchase will be a rigger brush. I’ve been working with a round brush 0 or 1 and I think the rigger would be good for some of the more intricate details I need when flowers or lines are small. Lots still to learn! Thanks for sharing the process with me! Blessings on your Easter friends. Praying you will be encouraged and impacted by the love of Christ this season. A friend of ours was married last weekend and it was lovely to see them commit their lives to each other. They wrote and spoke some beautiful meaningful and personal vows that were very touching. I’m not usually big on hand written vows because I have seen them not say enough - or try to promise the moon, but these were lovely and sacrificial, real and authentic. A beautiful expression of their covenant to each other. 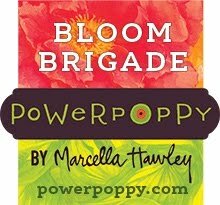 I created this design for their wedding card with Power Poppy’s Abundant Petals, which is abudantly gorgeous! I always have a hard time narrowing down which parts of this set I want to use. 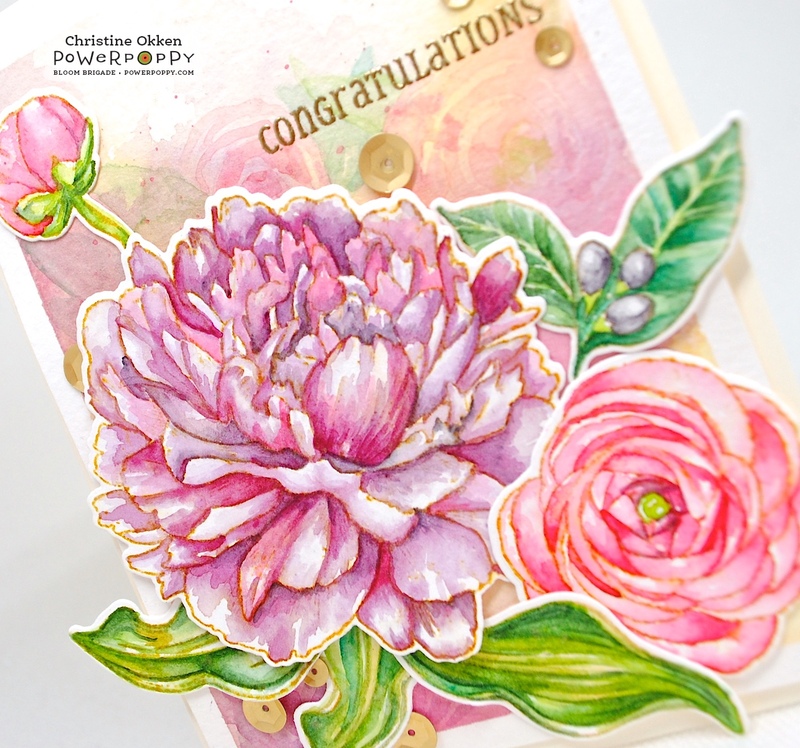 I stamped the peony, ranunculus florals and leaves onto Strathmore Cold Pressed watercolour paper with Distress Ink in Tea Die ink so the lines would fade a bit when watercoloured. Watercolouring is done with Daniel Smith Watercolours using Quinachridone Coral, Quinachridone Rose, Quinachridone Gold, Hookers Green, Jadite Green, Phthalo Turquoise, Lunar Violet and and Quinachridone Red. All of the elements were done with time between layers so that I could build up some colour vibrance in the blooms. 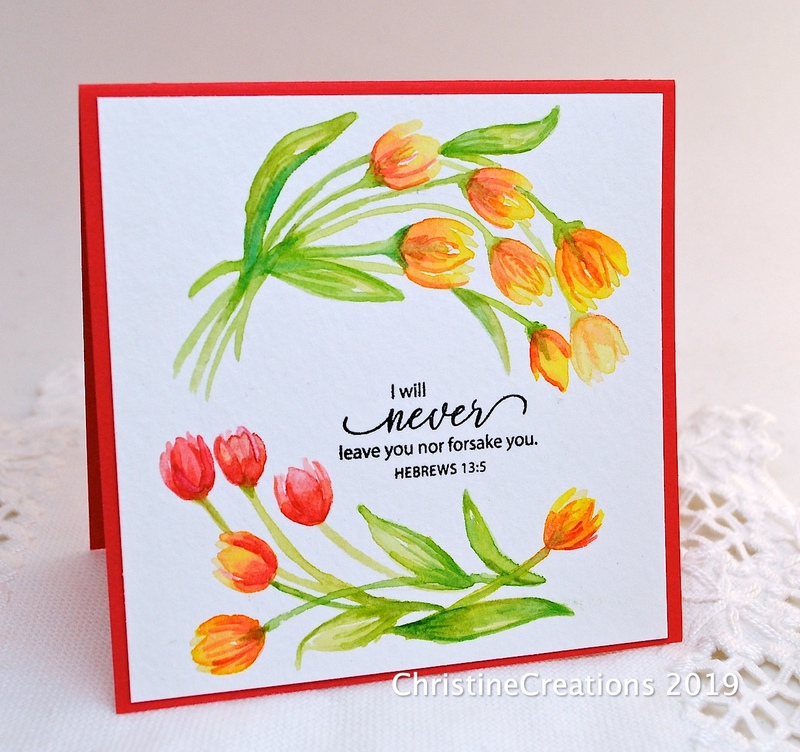 I used the Coordinating Dies for this set to put it all in pieces that I could work with to form the bouquet. I’m not a flower designer so it take me a little bit of time to fiddle with it until I get an arrangement I like. Then I took a quick picture of the way I liked it and worked on the background. I washed in some soft and watery Quinachridone Gold and Quinachridone Coral to the background, adding a bit of Quin. Rose as I went. After it was all dry I took some light washes of colour to paint in some leaves and Ranunuculus into the background so it looks like it’s in a field of flowers, or part of a larger bouquet. Just the soft suggestion of painted flowers really makes a lovely difference in the overall card. 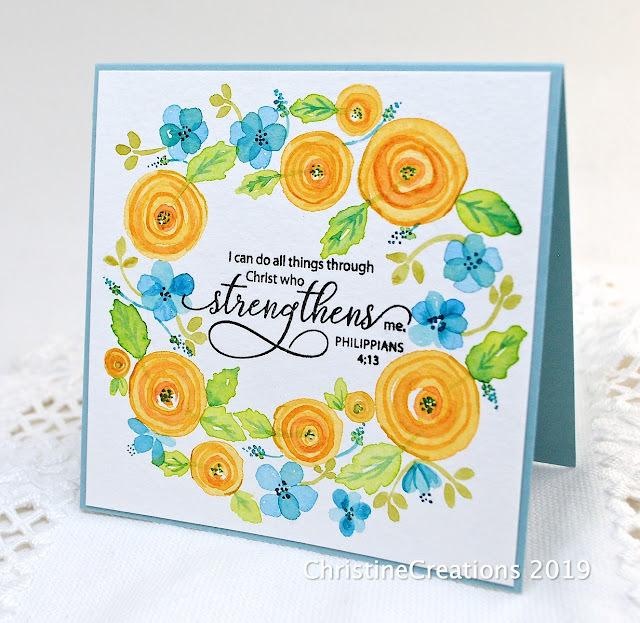 Here you get a better look at the background, and the brushed gold sequins to accent and the embossed sentiment from another Power Poppy set, Dream Wedding. I splashed some leftover paint and shimmery gold spray at the end to complete the design. Finished card is about 4 3/4 by 6” completed. We’re back with The Cat’s Pajamas and a reminder about our monthly challenge. 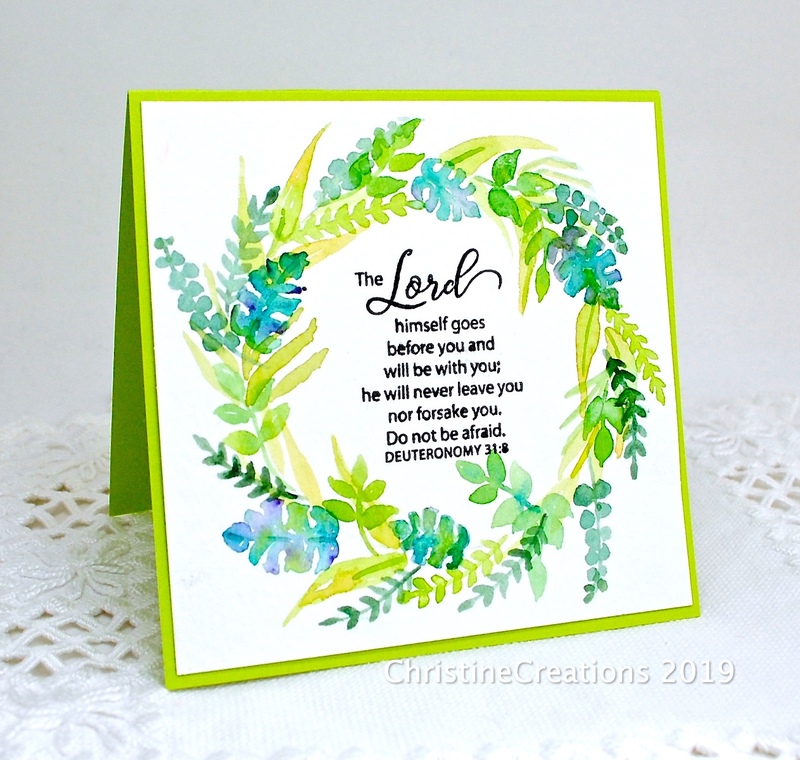 This month’s theme is Spring! 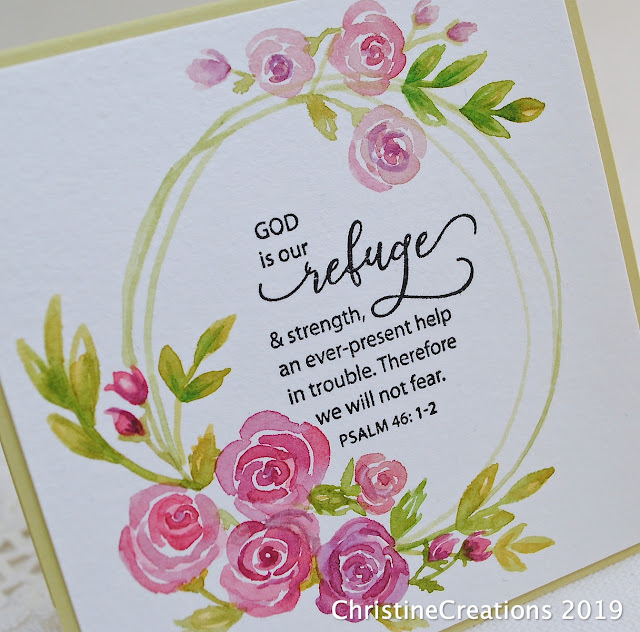 There are so many ways you could go with this theme and I decided to think of some dreamy Spring travelling. I’d love to be getting on a plane and exploring some new part of the world today. I played with some new goodies from this month’s release including the new stamp set Travel Stickers. I love the stamps in this set! It has some fabulous countries represented. 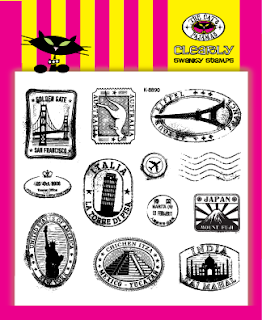 For my inspiration, I thought of how a passport might feel when it has lots of stamps in it. 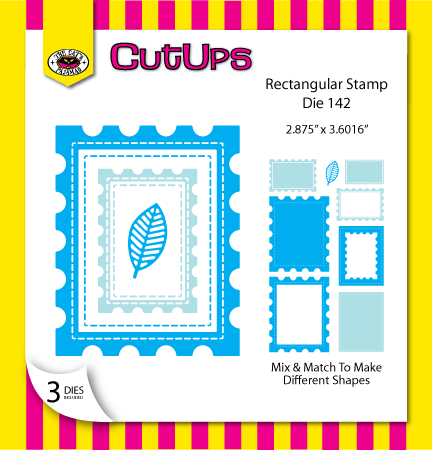 I stamped the images in a collage style in Pool Party ink, then added some images popped up using the Rectangular Stamp Die. I’ve added some pops of colour in red ink and some red accents. The red fishtale banner is cut with TCP’s new die Stitched Squares and More and then there’s the sweet little hearts using the new Mailbox Die. A few enamel dots and some splashy ink in the backround give it some texture. Here are some of the new TCP items I used today. Jump in and join us! You have a two more weeks to play along with our Spring inspired challenge, and you could win a TCP Gift voucher of $50 just for playing! This little beauty from Power Poppy is just my kind of bouquet, beautiful flowers like Roses, Cyclamen, Redbud and a pretty fern along with some fun art supplies tucked in, plus a wee ladybug and pretty bees! 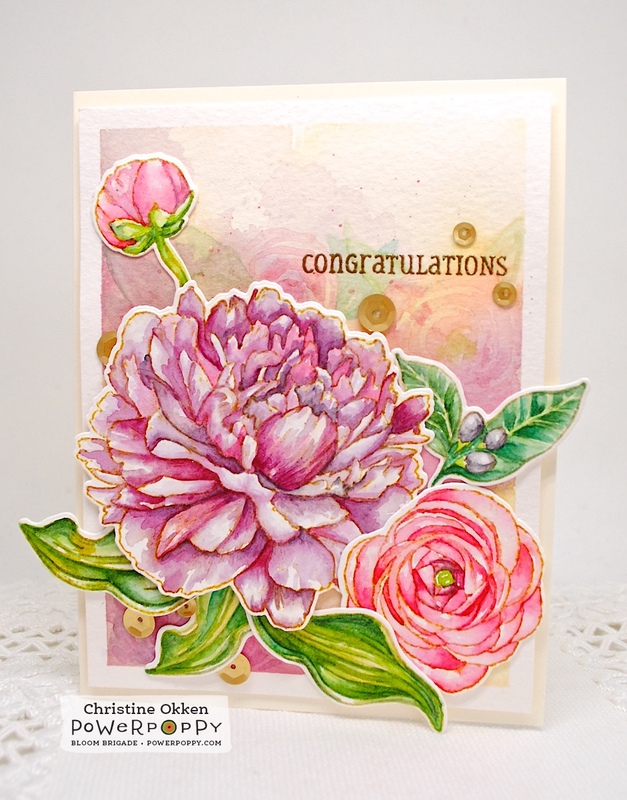 It’s called Artistic Bouquet, and the even better news is that its on SALE this weekend with the Weekend Stamp Steal! 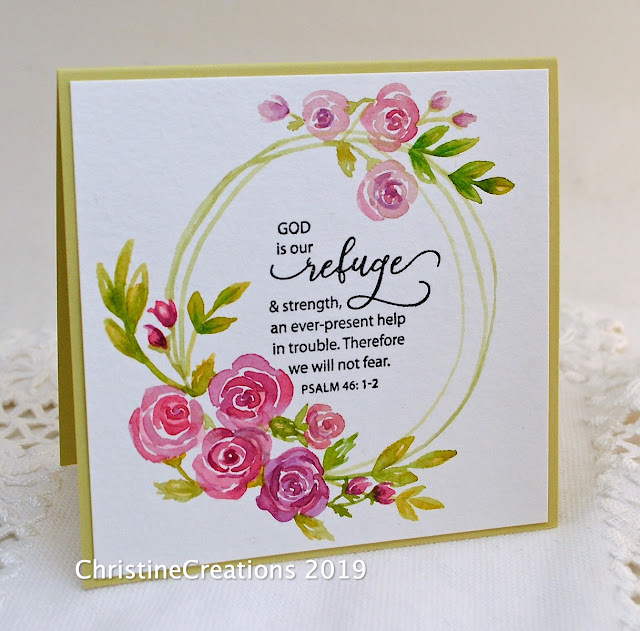 Marcy’s offering both the pretty polymer stamp set and the digital version Rosé All Day at a steal for this weekend only! I didn’t use all of the stamped image but stamped about 2/3 of the bouquet tipped in to the side. 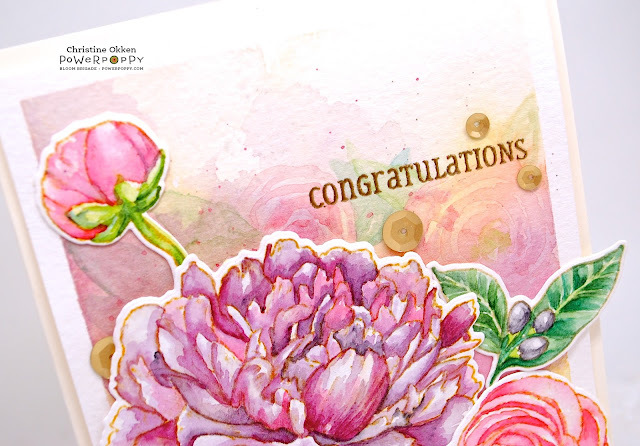 The image is coloured with Copics showcasing some lovely rich shades. I added some shimmer to the bee wings with a glitter pen. 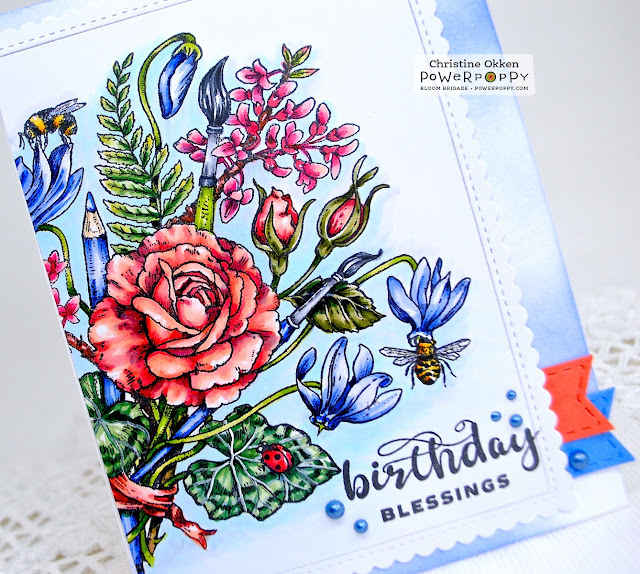 The scripty Birthday sentiment is included in the stamp set, and I accented it with some Nuvo Crystal Drops in Navy Blue. 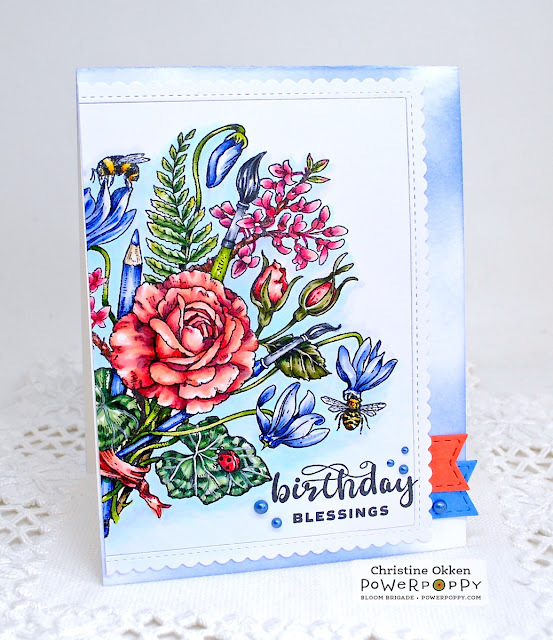 I sponged in a bit of moody background ink with Blueprint Sketch Distress Ink, and I tucked in some fishtale pennant banners picking up some of the colours in the bouquet. Hello! I’ve been doing a bit more watercolouring this week to continue my series of original art wreaths. The first two of the series are Here and Here. I’m trying to branch out - so to speak - with some different styles of flowers and improve my brushstrokes. This is such new territory for me, because whenever I’ve done original art in the past, I always sketch first. Here, I’m starting just with brush and paint. So...sometimes I have more success than others! I’m also trying to develop my own style, and I think that takes a long time to figure out. So, I’ll continue to call these experiments :)! Happy ones, because I’m enjoying myself, but still works in progress. Today I’ll start with this fun one that is supposed to be a loose interpretation of sunny ranunculus blooms. I think that’s one unique thing about watercolour, it can be very detailed and precise as a medium, but it's often an equally successful medium by its suggestion of shape, with brushstroke and colour. Your eye fills in the details and reads it as (hopefully) what the artist intends. That said, my youngest son thought they were woodcuts! (ha!) Obviously I still have a ways to go! All of these cards today are painted with Daniel Smith Watercolours. This one above in Quinachridone Gold, Quinachridone Coral, Phthalo Turquoise, Hookers Green, Hansa Medium Yellow and Cobolt Blue. 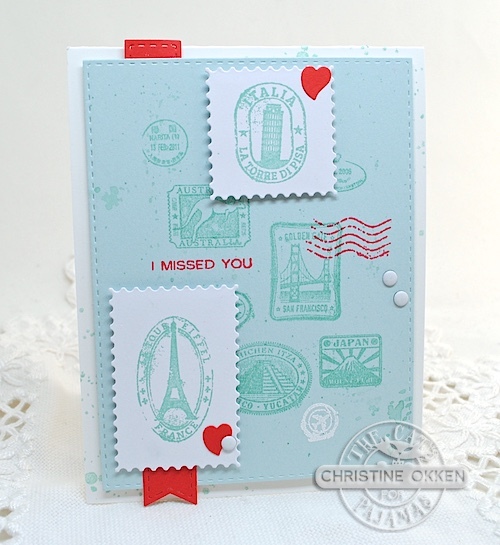 The sentiment is Stamp Simply’s lovely set, Encouragement Combo. I love how these irises turned out, but they started out as a completely different flower! But the more I looked at them, the more I saw iris, so that’s the direction I went. I really wish I would have tipped that bottom iris a bit to the left so it followed the curve of the circle better, but once the paint is down, it’s down. 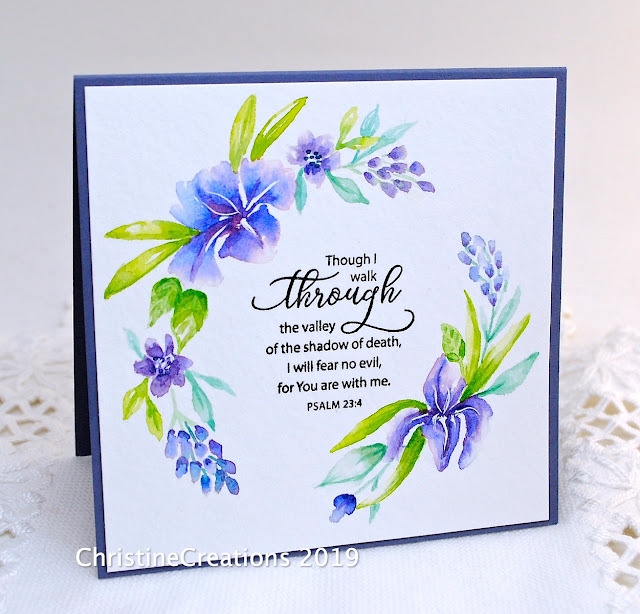 This design also uses the above Phthalo Turquoise, Hansa Yellow and Hookers Green, and adds Quinachridone Rose to mix with Cobolt Blue to create the pretty purples. 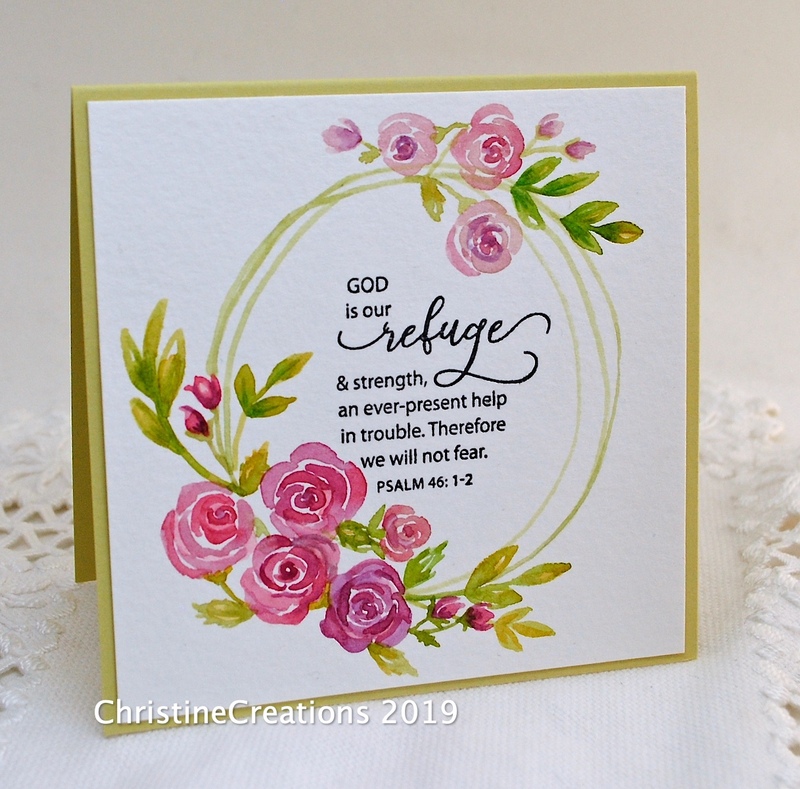 The sentiment is from Stamp Simply’s set Fear Not. 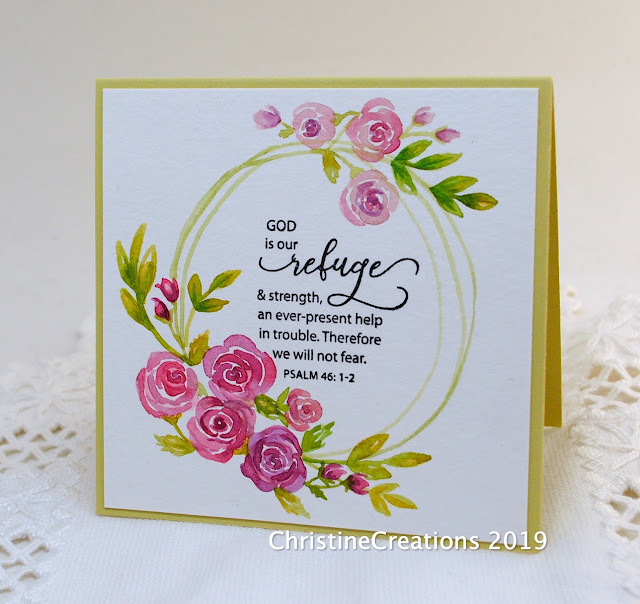 Lastly for today, I created some more tiny roses and greenery for this one. I’m learning to start more gradually with softer colours and more washes rather than bold colour right up front. In that way, it’s the opposite from Copics where you blend out your colour, watercolour is soft washes that build colour in layers. Completely different mindset for my brain! 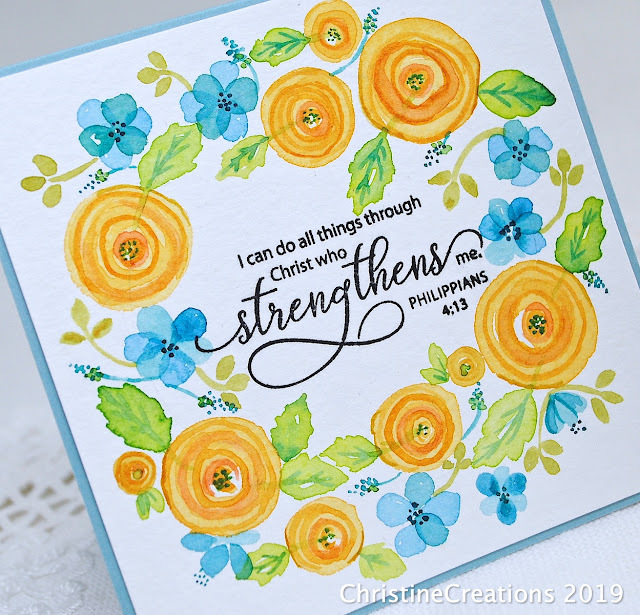 This sentiment is also created with Stamp Simply’s set, Encouragement Combo. And, all of these designs are painted on Strathmore Cold Pressed 140 lb paper. It’s nice and sturdy for the card designs. Heavy enough to even be used as card weight.